David Strath, born 1849 in West Burn Lane, St Andrews, son of Alexander Strath, a General Contractor and his second wife Susan Reid. 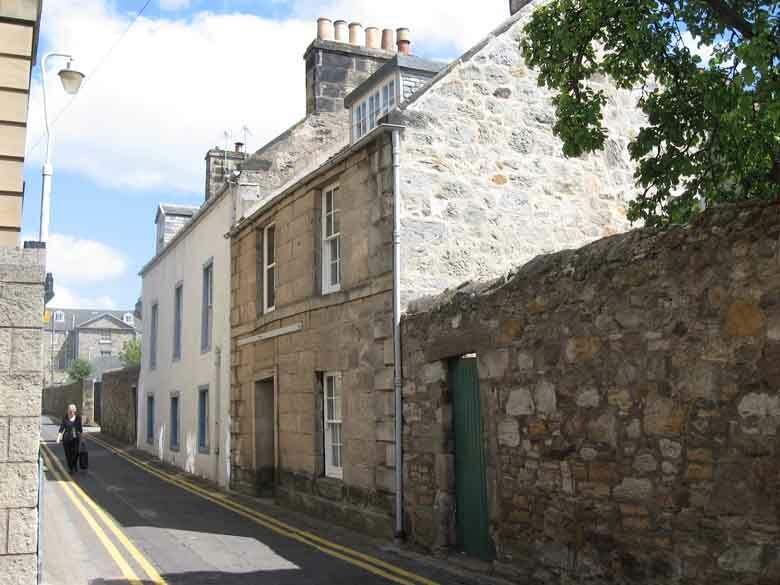 David moved with his parents, six brothers and two sisters to 4 Crails Lane, and then to 99 South Street, St Andrews. David was a law clerk in a legal office in St Andrews and learned to play golf from his brother Andrew who was a greenkeeper at Musselburgh before he followed Charlie Hunter and Old Tom Morris as head greenkeeper at Prestwick. Davie Strath joined the professional ranks in 1868 and that year he entered his first professional tournament organised by the St Andrews Professional Golfers Association. Strath won three major professional tournaments in the 1870s, Carounstie (1870), St Andrews (1873) and Glasgow (1878). In those days it was a common sight to see the deep-cut-divot from Davie Strath's full iron strokes hurtling through the air. In April 1872 Davie Strath played in a Grand Professional Tournament at Royal Liverpool Golf Club. Organised by Robert Chambers, captain of Royal Liverpool and Tantallon Golf Clubs. A group of professionals were given rail tickets and supplied with an evening meal as guests of the club. Davie lead the tournament after two rounds but was overtaken in the final round by Tom Morris Jnr. who received a medal and fifteen pounds. This was the first professional tournament in England. During this period the matches played between Davie Strath and his close friend and rival Young Tom Morris were legendary and attracted thousands of spectators. The first account of a head-to-head between Tommy Morris and Davie Strath was in May 1869. The same month they took on David Park and Bob Ferguson for £50-a-side and won. The 'Great Golf Match' reported in the national press took place between Tommy and Davie Strath in July 1873. Played over three days and six rounds at St Andrews for a purse of £50 which Tommy won. The rematch was played four weeks later when Jamie Anderson carried Tommy's clubs and Tom Kydd caddied for Davie Strath who won the match. Horace Hutchinson wrote 'For brilliant and steady play combined with absence of mistakes, the golf Young Tom Morris and Davie Strath exhibited day after day has never been surpassed. Strath's style was the very poetry of swing, the most perfectly graceful and easy that can be imagined.' Almost single handly they increased the public interest in golf and gave their fellow professionals respectability. In 1872 the Town Council's at Leven and North Berwick offered Young Tom Morris and Davie Strath, twenty-five pounds each to play an exhibition match. This was in effect appearance money which would have been frowned upon had the North Berwick Town Council not kept the matter quiet. "A protest was lodged against Strath representing North Berwick, alleging he struck a spectator with his approach to the 17th green." This article on the proposed extension of the West Links at North Berwick was published in 'The Scotsman' on 19th December 1876. 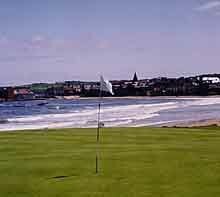 "The committee of the North Berwick Golf Club have obtained permission from Right Hon. Mr. and Lady Nisbet Hamilton to play golf over new ground to the west of the present Links. - making ten additional holes, thus increasing the round to nineteen holes in all. By the terms of agreement the committee are to pay to the tenant of the farm £45 a year and are bound to have a man on the new green for the purpose of keeping it in order, and excluding all who have not admission tickets, which will be supplied to golfers by D. Strath, who is appointed to take charge. The course will be laid out by Tom Morris and D. Strath, and no expense will be spared to make it thoroughly efficient." Davie Strath regularly played the West Links partnering local golfers Peter Brodie and John Whitecross. When the position of Keeper Of The Green was created Strath was the natural choice. Although it has been suggested that Young Tom Morris was also offered the position in 1873. Davie Strath was appointed Custodian of the Green on 5th September 1876. Tantallon Golf Club agreed to pay twenty-five pounds as their share of his salary and North Berwick Golf Club paid ten pounds. Strath was a keen sportsman and was often found in the evening lying out at the Eil Burn shooting wild ducks. 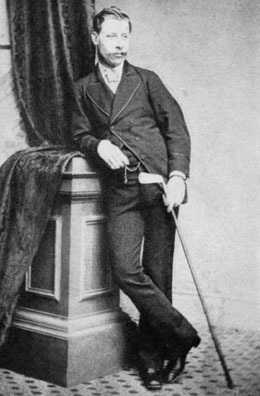 Strath was runner-up in the Open to Young Tom Morris in 1870 and 1872, and in 1876 he tied for the Championship at St Andrews with Bob Martin but refused to play off because of a rules dispute. This was one of the most controversial Opens of all time as someone had forgotten to book the golf course and players were competing amongst the regular public players. The St Andrews Citizen reported competitors went out in 'a very straggling manner'. A protest was lodged against Strath who was representing North Berwick, alleging he played his approach to the 17th green and struck a spectator. The Royal & Ancient ordered the replay but Strath demurred and said if a decision wasn't taken forthwith, he wouldn't return. Martin walked the course alone and was declared the winner. After this debacle, Strath never played St Andrews again. The following year he entered the Open at Musselburgh and finished 4th in a small field of players. In April 1877 at the official opening of the new course Davie Strath as Keeper of The Green was given the honour of teeing the ball for Sir Hew Dalrymple who played the first stroke. His driving club was specially made for that occasion by Messrs Strath and Beveridge. The clubmakers workshop was situated in the quarry below the first green, where Davie Strath and James Beveridge made clubs and balls. In 1882 Willie Dunn's timber workshop was situated beside the first tee. Davie's playing reputation increased after he defeated, Bob Ferguson, Willie Park and Mungo Park in challenge matches over the links at North Berwick. In 1877, Davie Strath had a famous victory over the celebrated amateur Alex Mackenzie-Ross at North Berwick. A.M. Ross was a member of Tantallon Golf Club and Royal Burgess and gave this account of the game. - " I was receiving a third and one round of the green was to prove the conqueror. At this distant date I cannot describe the match minutely, but you will understand the form when I say I had ten 'fours' in succession beginning at the third hole. Davie's game was nothing less than phenomenal, he having no less than six 'three's and two 'twos' in the round, and this when the new course had just been added to the old green and you will recollect 'Shipka Pass. at that time was a caution to wild drivers. The straight and narrow path led on to Elysium, the broad road led to destruction. The game proceeded in a ding-dong kind of manner until arriving at the gate, where Davie was 1 up and 2 to play. In playing Point Garry I holed in 4 from the top of the hill, 20 yards or so, the game being thus all even and 1 to play. For the purpose of this match the holes had been newly made, but they did not alter the hole on the home green and this mistake won Davie the match, as I lay dead in three and Davie played the like and lay for a minute it seemed on the top side of the hole; but as I went to play Davie's ball toppled into the hole thus wining the match by 1 hole. The crowd, which was very large all thought it ought to have been a halved match. I venture to say, no game played on North Berwick has equaled this truly wonderful round of Strath's taking the hazards, etc. into consideration. The first measure of course difficulty was par. The word par is derived from stocks; i.e., "a stock may be above or below its normal, or par figure." In 1870 golf writer A.H. Doleman asked Davie Strath and Jamie Anderson what score would be required to win the Championship Belt on the12-hole course at Prestwick. Their response was that perfect play should produce a score of 49. Mr. Doleman called this par for Prestwick and when Young Tom Morris scored two strokes over par for three rounds (36 holes) to win the Open Championship, the term stuck. When Davie and Agnes arrived in North Berwick they stayed with Tom Hope and his sister Alice who had a Bookseller and Stationary business at 32 High Street (now 40-42 High Street). 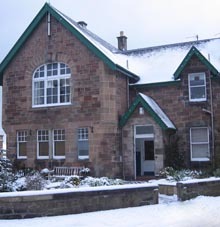 They lived above the shop where the Strath children were born. 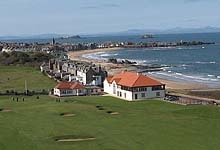 Tom Hope was a keen golfer and founder member of the Bass Rock Golf Club playing over the West Links at North Berwick. Tom won the club Summer Scratch Medal in 1877. Strath partnered Tom in several money matches and in July 1876 they defeated Mungo Park and John Campbell in an evening match over two rounds of the West Links followed by a large gallery of spectators. Davie Strath and his wife Ann (Agnes) secured a bond of £450 from the Standard Property Investment Co. Ltd. and were able to purchase Point Garry Cottage, (now Tantallon Clubhouse) in May 1877 from David J. Brown, a Baker and Confectioner with shops at 44 Leven Street and 161 High Street, Edinburgh. In May 1876, Agnes Strath instructed Robert Lyle solicitor in North Berwick to draw up her Will which was witnessed by Hugh Gilles MacBain, Physician and Surgeon, High Street, North Berwick and Tom and Alice Hope, 32 High Street. Davie Strath suffered from consumption and facing another Scottish winter was advised to travel to Australia where the climate would alleviate an illness which also claimed the life of his brother Andrew. On 14th October 1878 Strath sailed from Liverpool with a first class ticket on the S. S. Eurynome, the fastest vessel of the time. During the 84-day voyage he contracted acute bronchial laryngitis and arrived in Melbourne in a poor state of health. He died 20 days later on 28th January 1879 aged 29 years. Strath died in a house on Royal Terrace in the Carlton district of Melbourne, but due to a clerical error his death was recorded as 'David Struth' and his remains buried in an unmarked grave in the Presbyterian section of the Melbourne General Cemetery. It was not until 2005 that two golf historians discovered the truth and were able to erect a headstone over his grave. Among the debtors listed in Davie and Agnes Strath's estate were Peter Brodie Snr. Sir Alexander Kinloch (Gilmerton) Sir David Baird (Newbyth) George Strath (professional golfer Glasgow), H. Hope (Luffness) B. Hall Blyth (Edinburgh), Rev. J. Kerr (Dirleton), Sir Robert Hay (Hayston) W. Laidlay (Seacliff), James Beveridge (Clubmaker North Berwick), Sir Hugh Hume Campbell (Marchmont, Duns). The Will was later amended by Donald Jackson apprentice to Robert Lyle with instructions that on the death of Agnes Ronald or Strath her children should be looked after by her Aunt Christina Lee, 25 Constitution Street, Dundee. This was witnessed by Rev William Calvert, minister of the United Presbyterian Church, North Berwick. The Will was registered at Haddington Sheriff Court, 11th February 1880. Davie's wife Ann (Agnes) and their two children Ronald (2 years) and Daisy (1 year) remained in North Berwick. Ann died a year later on 8 January 1880 and the official cause of her death was peritonitis but more probably she died of a broken heart, aged 36 years. Her orphaned children were taken to Dundee and made a Ward of Court by Christina Lee (m/s Robertson). Christina's husband William Lee was a Ship's Master and their son John F. Lee was a partner in Lee, Croll & Co. Engineers and Ironfounders, employing forty men in the Ward Foundry, Dundee. In May 1880 the Trustee's of Agnes Strath's estate sold Point Garry Cottage to Archibald Smith, a Coal Merchant in Lothian Road, Edinburgh. Point Garry Cottage, was converted into a clubhouse for Tantallon Golf Club in 1896. Following the death of Ann Strath, Tom Hope emigrated to Australia and settled in Mackay district north of Brisbane, Queensland. Tom and his brother Henry were Marine Engineers and their sister Alice Hope continued the newsagent’s business at 32 High Street, North Berwick (now No.44) until 1888. Alice suffered ill-health and was persuaded to travel to Australia by Capt. J. H .C. Adrain who worked on overseas ships with her brothers. Alice resided in Mackay with Tom until his death in 1911. Henry was engineer manager of the Lansdowne Race course and resided in McAlister Street. Alice died in January 1935 aged ninety years. The newsagent's business in North Berwick was taken over by Margaret Brownlee in 1888 and her son Leslie Brownlee joined the ranks of the golf professionals in America. Davie's elder brother William was a gardener to trade and in 1864 he finished sixth in the Open Championship at Prestwick. The following year, when his older brother Andrew Strath won the championship, William finished eighth. Andrew was a clubmaker with James Wilson and caddied for the gentlemen golfers at St Andrews. He followed Old Tom Morris and Charlie Hunter as head greenkeeper at Prestwick and was runner-up in the Open in 1864. Andrew put such a tremendous amount of cut on his ball that it ran backwards rather than forwards. From 1860 until 1868 Andrew was the only professional to have his name included among the winners during a period dominated by Park and the Morrises. Andrew died in 1868 aged 33 years. Davie's other brother's John and George Strath apprenticed as plumbers before George was appointed golf pro at Troon (1881-87). He moved to Southport Old Links (1888-92), then Stinchcombe (1893-94) and North Manchester (1894-95). His best finish in the Open Championship was 14th at Prestwick in 1878. George emigrated to America and in January 1896 he was appointed pro at Dyker Meadow G.C. That year he finished 22nd in the US Open at Shinnecock Hills. George moved to Wee Burn C.C in 1900, then to Oakland G.C (Queens, New York), before being appointed instructor at the Crescent Athletic Club, Brooklyn, New York. George played in many exhibition matches with Tom Anderson the former head greenkeeper at North Berwick, and pro at Montclair G.C. New York. George followed Jack Hobens as President of the Eastern Professional Golfers Association in 1915. George Strath died February 1919 aged 76 years. In 1901 a number of golf related items were displayed at the Glasgow International Exhibition, including the Championship Belt and putters used by Tommy Morris, his father, Davie Strath and Allan Robertson. The Strath brothers will always be associated with the formidable bunker guarding the right-side of the 11th green at St Andrews which bares their name and Point Garry Cottage (now Tantallon Clubhouse) in North Berwick where Davie Strath and his family lived. Copyright © Douglas C. Seaton 2016, All Rights Reserved.